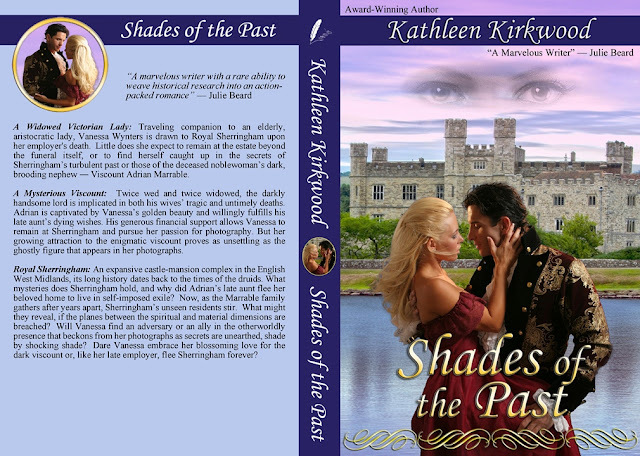 This is the last post on the development of the SHADES OF THE PAST cover and it discusses the creation of the back cover, the spine and the integration of all of the elements into the cover flat (the printed art cardboard cover that gets wrapped around the book). I used Adobe Photoshop to create the back cover and Serif DrawPlus to create the spine and integrate everything into the cover flat (when we created the A SLIP IN TIME cover, I shifted over to Adobe InDesign to integrate the elements for the cover flat – I’ll talk about that in a future post). Please keep in mind that, when you’re working with a print version, the final cover needs to be at 300 dots per inch resolution. And, it needs to be submitted to Createspace in PDF print-ready format. This results in a 20MB (approximately) cover flat to be uploaded to Createspace. As usual, Anita had an idea of what she was looking for on the back cover (which was based on the Lords of Midnight cover version). 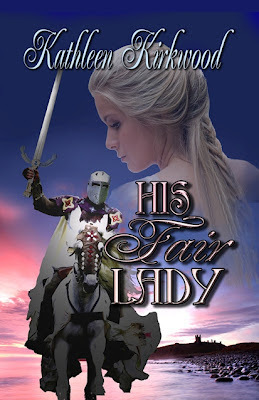 She wanted a banner with the book title across the top, a cameo of the couple, the full Julie Beard quote and the write-up she developed for her website. We decided to use a pale blue background for the back cover, with a dark blue spine separating the front and back covers. The pale blue color was chosen to match the shade of blue of the water on the front cover (as closely as we could get it). The dark blue for the spine and back banners was the same color we used for the banner on the front cover. The back cover banner was created the same way as the front cover banner (as discussed in my earlier post on text and banners for the front cover). The back cover banner text is unenhanced, pure white Monotype Corsiva. The remainder of the back cover text is in 11.5 point Times New Roman, also unenhanced except for bold and italics as needed for emphasis. This point size was chosen so there would be enough room left at the bottom of the cover for the UPC label, which Createspace would insert. The cameo – now that was quite a bit of work to produce. We took the third Jimmy Thomas photo that appeared in my last post and removed the background (as we did for the front cover “couple” photo). We then found a circular frame in the Dover collection, removed its background and added a color gradient to it. Lastly, we took a piece of the sky from the front cover background to use as the background for the cameo. By placing the sky layer in the background, the couple layer over that, and ring layer on top, we came up with the cameo. 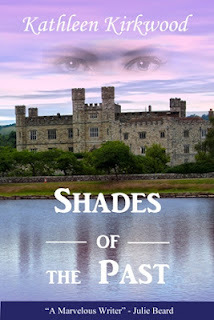 This post concludes the “Adventures in Cover Art” blog series for the SHADES OF THE PAST cover. I have a few more experiences to share in the development of the VENECIA’S EARTHLING, A SLIP IN TIME and HIS FAIR LADY covers. There will probably be one or two posts on each, dealing with the particular challenges encountered on each cover, not a longer complete series on all of the aspects as we’ve done for the SHADES OF THE PAST cover development. E-mail Anita if you have any questions on cover development. Her e-mail address is: kathleenkirkwood@aol.com. Late addition: the next cover art post will be on Castles, kilts and moonlit nights - A SLIP IN TIME, which will be released next week. Please check back on Monday, July 2nd. Thanks to everyone who emailed me their feedback on the "Castle on the Hill" and the size that Dunraven Castle should be. As always, I learn so much from the different points of view. So as to not "upstage" the couple on the cover, we decided to go with the slightly smaller castle. We tried an even smaller castle but the balance seemed "off." Best leave well enough alone. It was about this time that we started getting comments that the castle was crooked. Well, that was normal for a three-quarter view photo, as it was taken off-center (it’s a perspective issue). But, that continued to bother Anita, so I used Photoshop’s Straighten Tool to adjust it. You’ll also notice other changes we made along the way between these two images – banner, text effects and flourish. We talked about the banner and text (and effects) in the last post, so I won’t repeat any of that here. So, about the flourish . . . When we got our proof copies of the print version, we discovered that the cover got a lot darker, as the result of the printing process. In particular, the couple came out very dark. So I lightened the couple for the print cover (but not for the e-book covers). 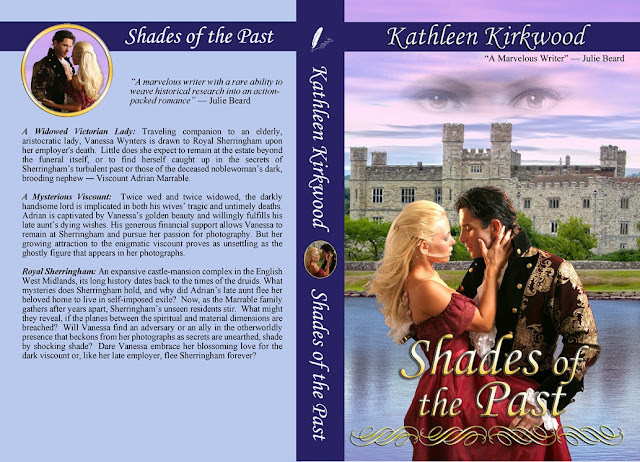 The final print cover is shown below. Next time, I’ll blog on the creation of the back cover and spine and the integration of the three elements into the cover flat. That post should wrap up the series on the creation of the SHADES OF THE PAST cover. Well, we’re at it again. Previously, Hubby and I held a little vote on three different versions of the new cover for A SLIP IN TIME, “Blue” won the day and features Edinburgh Castle on the hill. I bowed to popular choice which won by a sizable margin (I voted “Gold”), but the castle continued to bother me. The façade is just so plain and nothing like the description of Dunraven Castle in the book which is spotlighted time and again and is integral to the plot. Hubby endured my grumblings and a good bit of pleading, too (he may say “pestering”), and we tried some new looks. The new castle isn’t a perfect match to the story description either, but much closer – the key elements being Dunraven’s ancient keep, a massive tower rising on one end, and then additions and extensions built over time, in different styles, down through the centuries. We’d love your feedback as to which cover appeals to you most, and whether, as a reader, it makes a difference if the cover art matches the story – closely, somewhat, or not at all. Below are three different cover views – Edinburgh castle and two of the alternate castle (Culzean, with a slightly modified tower.) The difference in the two covers featuring Culzean is the size of the castle on the hill, the last being slightly smaller. Okay, maybe I am a perfectionist as accused (I won’t mention names), but it’s a matter of perspective and what looks appropriate on the hill. Click on any of the images to see all of them in higher definition. Please email me at KathleenKirkwood@aol.com.